Perenniel woodland herb, up to 30cm high, native to Europe, Caucasus, Sibiria; rhizome creeping; flowering shoots erect, glabrous, formed every year at the apex of the rhizome; leaves usually 4, elliptic to obovate, in a whorl at the top of the stem; inflorescence a single terminal, erect, long-stalked flower; sepals lanceolate, 2-3.5cm, green; petals nearly as long as sepals, greenish yellow; fruit a poisonous globose black berry. The crushed fresh herb was used externally in former times to treat wounds and ulcers, ailments of the eyes (doctrine of signatures: eye-resembling berry) and internally (rhizome) as emetic. Today the herb of P.quadrifolia is only used in homoepathic preparations to treat headache, inflammation of the upper respiratory system and problems with senses of smell and touch. 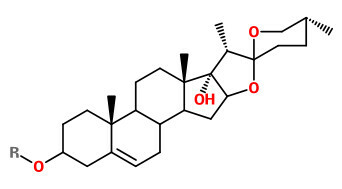 The sterodial saponin, pennogenin-3-O-α-L-rhamnopyranosyl-(1→4)-α-L-rhamnopyranosyl-(1→4)-α-L-rhamnopyranosyl-(1→2)]-β-D-glucopyranoside showed strong cardiotoxic effects in an in vitro cellular model system. Pennogenyl saponins pennogenin 3-O-α-L-rhamnopyranosyl-(1→4)-[α-L-rhamnopyranosyl-(1→2)]-β-D-glucopyranoside and pennogenin 3-O-α-L-rhamnopyranosyl-(1→4)-α-L-rhamnopyranosyl-(1→4)-[α-L-rhamnopyranosyl-(1→2)]-β-D-glucopyranoside exhibited strong cytotoxic activity against HL-60, HeLa and MCF-7 tumour cells. Regarding the the molecular mechanisms of cytotoxic effects of pennogenyl saponins, both the extrinsic death receptor and intrinsic mitochondrial pathways are involved in the programmed cell death.